Puckhead's Thoughts: You Make The Call - Was it Offside? 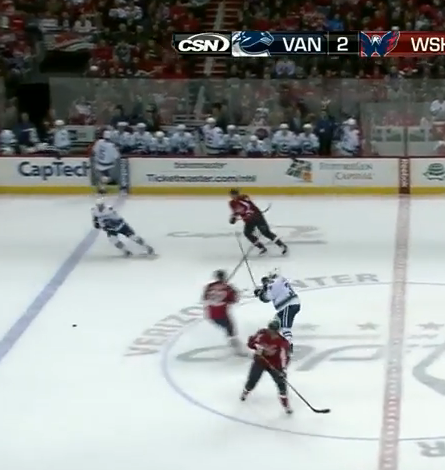 looks to me like Mike Green is out of position and trying to check a player that gave up the puck way before Green got there. oh, and Glass was offsides. nice work with the screengrabs. lol you're kidding right? Glass was not in play. Sorry Puckhead but you loose a lot of credibility when you post this nonsense. Actually, it makes no difference at all whether Glass was "in the play" or not -- that matters for a too many men on the ice penalty. 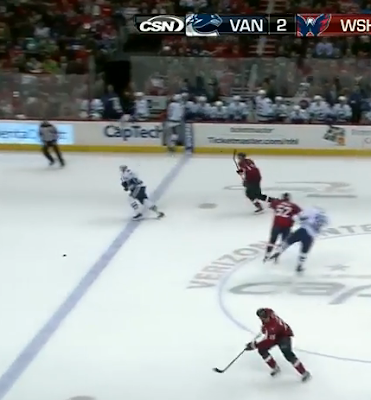 The rules on this are clear, if he's on the ice, in the zone ahead of the puck, it's offside. So don't talk about Puckhead losing credibility, you're the one who doesn't know the rules on offside. See NHL Rule 83.1. 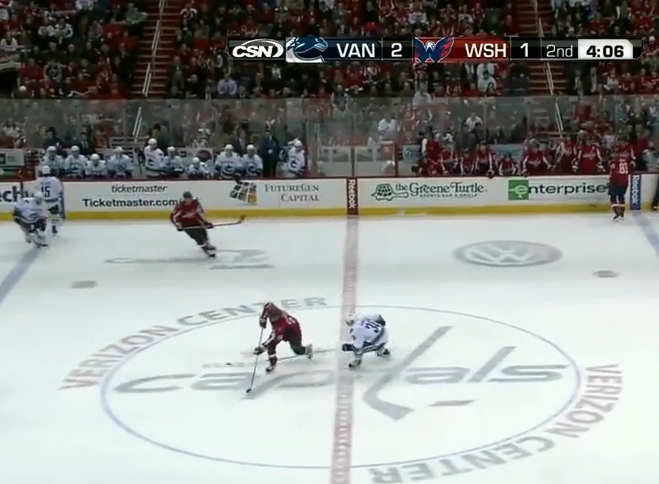 Your screengrab is not hi-def enough to tell whether Glass' skate is on the ice or not, which is the crucial question here. Interesting, got any ref friends that can clarify? 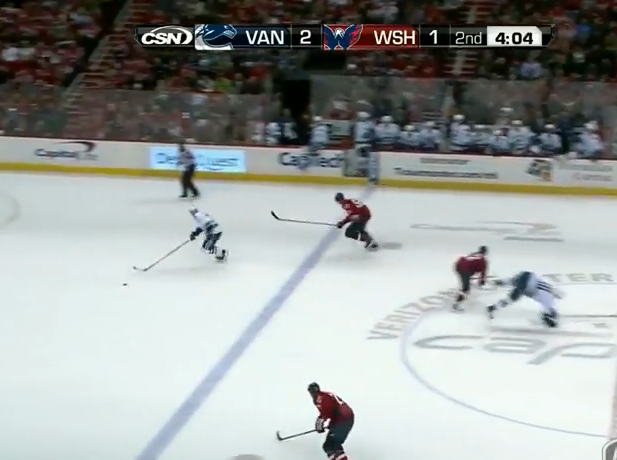 My gut says that it's not offside because he's coming off the ice. Clearly they don't make a player get 100% off the ice before his replacement is allowed to be there, so by that logic he has been replaced and is not involved in the play, therefore not on the ice. Some good points raised, I like it. In my experience, both playing and watching as many games as I have, this particular play is called off-sides a lot in college play and lower levels (possibly because the rinks are different college to college). 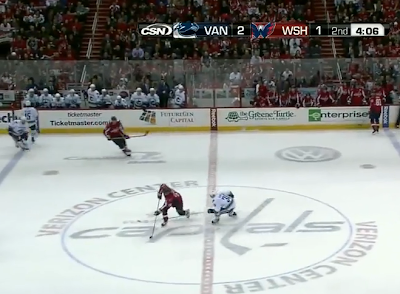 It is called less in the NHL for some reason. Every ice rink in the pros must meet the exact same specifications. In other words, everyone (players, coaches and officials) knows the far bench door is inside the zone in every rink in the NHL. I have seen it called before in the NHL, but it is not enforced rigidly (kinda like the goaltenders playing the puck outside the trapezoid behind the net). The off-sides rule is clear of any gray area in the NHL book, but as I suspect, if the linesman thinks you are out of the play than it's not worth the whistle.